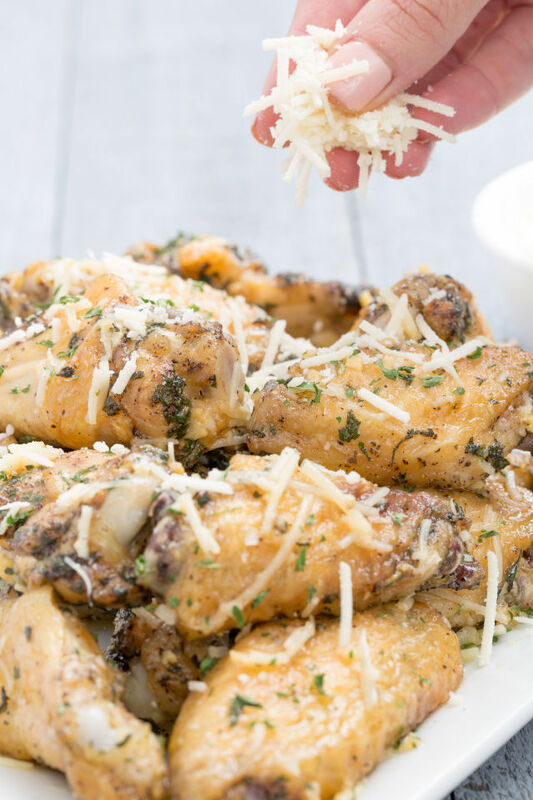 Monday night, we had garlic parmesan wings for dinner and they were really, really tasty. It was also the first time I'd cooked wings for us on a weeknight, so it was a nice little way to shake up the routine. I found the recipe via Pinterest, natch, and I had all of the ingredients already on hand. Big win. So, from Delish.com (original recipe here), here you go! I made coleslaw to serve alongside the wings and also tossed some carrot sticks in olive oil, cumin, salt and pepper and roasted them until they were as close to sweet potato fries as they'd ever get. They will still taste like carrots, but they are a nice sub for the fries! The kids love them, too. Let me know if you make these wings. It's a super inexpensive dish to make, too! Sounds delicious! My father-in-law made something similar and brought us a few and I may or may not have been eating the hardened parm cheese with my fingers. Not confirming or denying here, but wow was that delish!